When newspaper publisher Joseph Pulitzer died in 1911, he bequeathed $50,000 “for the erection of a fountain like those in the Place de la Concorde, Paris, France.” Pulitzer probably got the idea to locate the fountain in Grand Army Plaza from Karl Bitter, the Austrian sculptor, who proposed a symmetrical plaza for this area. After a closed design competition it was not surprising that Bitter and the architect Thomas Hastings were commissioned to create the fountain. To make the plaza symmetrical, the Sherman monument was moved 16 feet west to its present location. 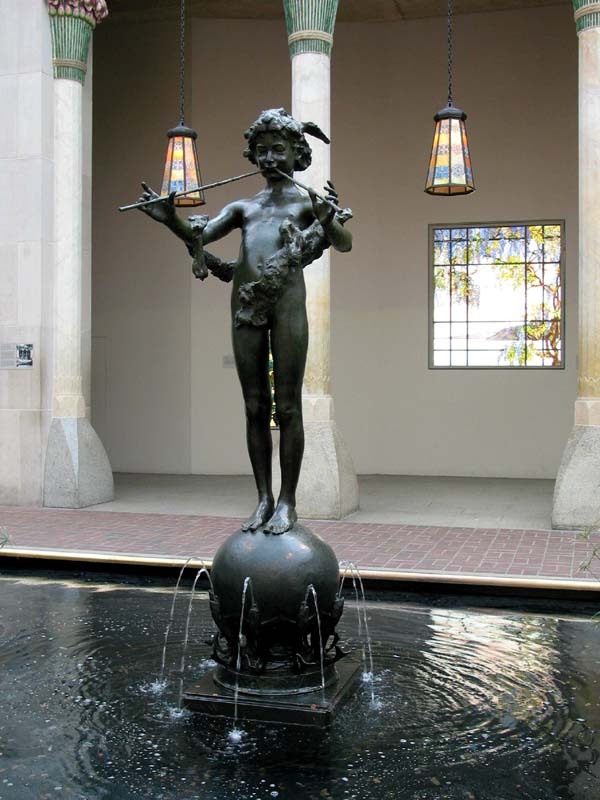 Bitter’s bronze sculpture represents Pomona, the Roman goddess of abundance. Rams’ heads with horns of plenty flank the fountain, again emphasizing the theme of wealth and material comfort. During the winter holiday season, lighted trees decorate the basin of the fountain, adding a festive touch to the Park’s entrance. The Pan of Rohallion fountain in The Metropolitan Museum of Art. at the Gruet Foundry. 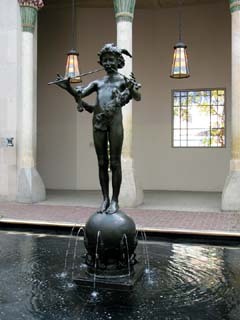 Pan is depicted as the young god of flocks and pastures, the forests and their wildlife, contentedly playing his reed pipes. The Columbus Statue Fountain and the construction of Time Warner Center. The fountain in front of the GM building and The Plaza Hotel. The fountain cascade at Rockefeller Center during 2003 X-mas season. At the western gateway to the Bryant Park is the pink granite Josephine Shaw Lowell Memorial Fountain, dedicated in 1912. This was the city’s first public memorial dedicated to a woman. Lowell (1843-1905) was a social worker and founder of the Charity Organization Society. Charles Adams Platt designed the fountain. To enter the six-acre Garden from Fifth Avenue and 105th Street, you must pass through the Vanderbilt Gate, which originally stood before the Vanderbilt Mansion at Fifth Avenue and 58th Street, the site of today’s Bergdorf Goodman store. An Italian-style garden opens immediately before you. It is a restful oasis of formal green lawn and clipped hedges. It is bordered to the north and south by alleés of crabapple trees; their bloom times vary from mid-April through the first week of May, depending on the weather. Christopher Street fountain in Hudson River Park, near Pier 45. 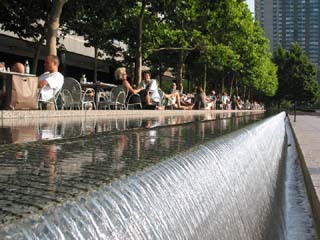 The fountain and the outdoor restaurant in front of the 2 World Financial Center building. The fountain across 61st Street from The Pierre.